Doesn't Santa give everyone a Mexican redknee tarantula for Christmas? Oh, you didn't get yours? 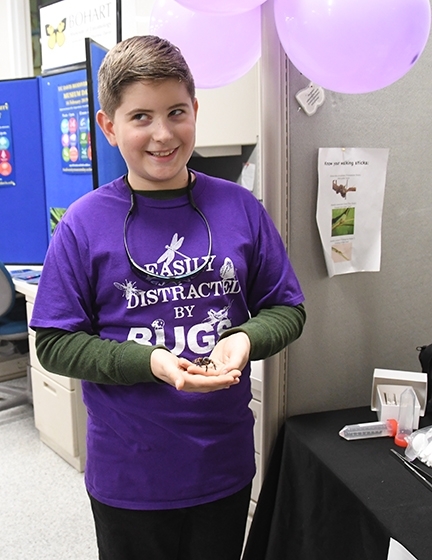 Well, Delsin Russell, 9, of Vacaville, did, and he and his mother journeyed Saturday, Jan. 12 to the Bohart Museum of Entomology open house on the University of California, Davis, campus, to show it to scientists and perhaps get it sexed. Male or female? That's still uncertain. Russell, wearing a purple t-shirt lettered with "Easily Distracted by Bugs," said Santa knew what he wanted and delivered his much-wanted--and now much-cherished--tarantula to him. According to Wikipedia, the Mexican redknee tarantula, as the name implies, is a native of Mexico: "It's a popular choice as pets among tarantula keepers." 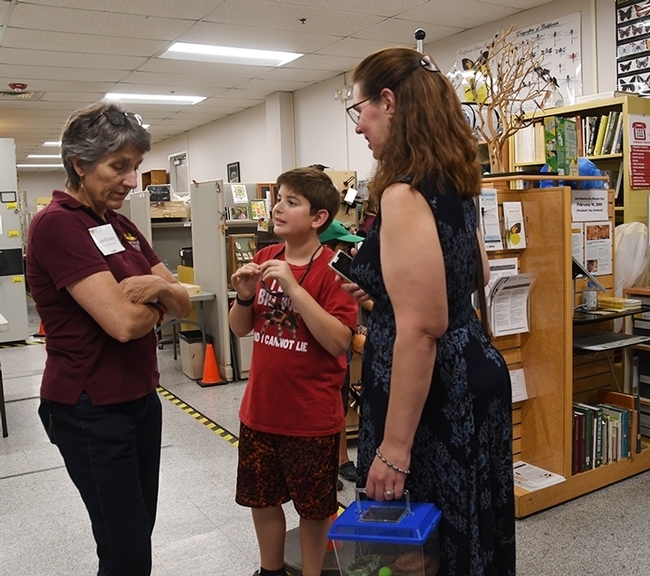 No strangers to the Bohart Museum, Delsin and his mother, Beth Russell, attended the insect museum's open house last August featuring extreme insects. (Delsin wore an insect-themed shirt, "I like big bugs; I cannot lie.") 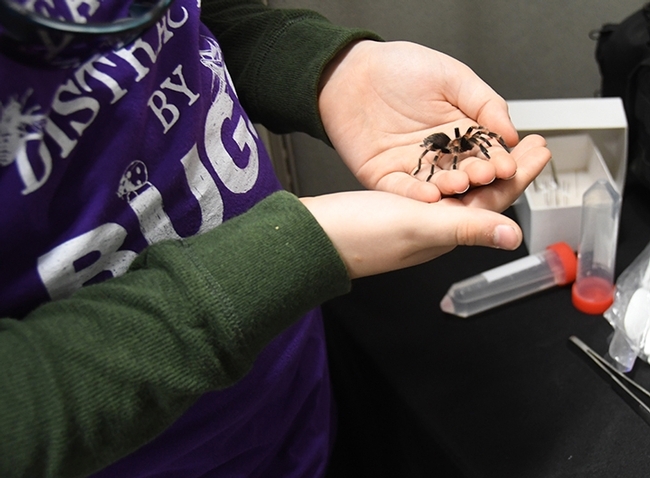 The open house featured "insects that can live in intense heat, cold, acidity or salinity." A wide variety insects, including flies, beetles, wasps and more, can live in these extreme conditions. Some species are even attracted to fire, said Lynn Kimsey, director of the Bohart Museum and UC Davis professor of entomology. As for Delsin, he aims for a career as an entomologist. Currently, he's enrolled in a beekeeping project in the Vaca Valley 4-H Club--and taking very good care of his Mexican redknee tarantula. Goes to prove that Santa isn't afraid of tarantulas. They're welcome in his sleigh. The Bohart Museum is planning three more open houses during the academic year. Saturday, Feb. 16, from 9 a.m. to 1 p.m., during campuswide Biodiversity Museum Day. Saturday, April 13 from 10 to 3 p.m. as part of the UC Davis Picnic Day. The Bohart Museum, located in Room 1124 of the Academic Surge Building on Crocker Lane, UC Davis campus, is the home of nearly eight million insect specimens, plus a year-around gift shop and a live "petting zoo" (think Madagascar hissing cockroaches, walking sticks and tarantulas) and a year-around gift shop. It is open to the general public Mondays through Thursdays, from 9 a.m. to noon and from 1 to 5 p.m. It hosts occasional, weekend open houses​. Admission is free. Further information is available on the Bohart Museum website at http://bohart.ucdavis.edu/ or contact (530) 753-0493 or bmuseum@ucdavis.edu. Wednesday, April 24 is the date of a UC Davis Department of Entomology and Nematology seminar to be presented by postdoctoral researcher Sarah Stellwagen of the University of Maryland, College Park. She will speak on “Toward Spider Glue: From Material Properties to Sequencing the Longest Silk Family Gene" from 4:10 to 5 p.m. in 122 Briggs Hall, located on Kleiber Hall Drive. (See new story on spider glue.) Medical entomologist Geoffrey Attardo, assistant professor, UC Davis Department of Entomology and Nematology, is coordinating the seminars. As a self-proclaimed "bug nerd" and spider lover, I got a real kick out of this article and Delsin's t-shirt slogans. So great to see someone so young interested in becoming an entomologist!